You might be thinking, well this is a little late. Wasn't Thanksgiving last week? Why didn't I know about this recipe like 10 days ago? That way I could've skipped mashing all those damn potatoes. Don't fret. 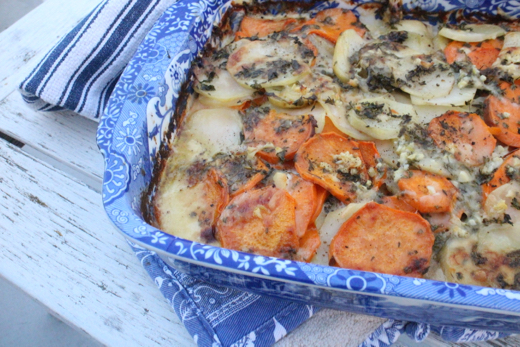 I'm cooking Christmas dinner for our entire family this year, and this scalloped potato dish will reign. I still have three weeks to plan the menu, but there is no way I'd leave this recipe out. For as long as I've lived in Los Angeles, my outrageously talented and gorgeous girlfriends have gotten together for an annual potluck Holiday party and gift exchange. Two years ago I brought this dish which was literally destroyed within minutes of counter touch-down. It is not light; it is not vegan; it is not anything other than savory perfection. And I challenge you to either complement your mashed potatoes with this recipe, or completely substitute. This year, I am hosting the gal party at our new(ish) house for Sunday brunch. It's a first; in lieu of a debaucherous, wine guzzling white elephant evening, we'll be taking down mimosas and lining up at an over-the-top Bloody Mary bar, while indulging in Joan's on Third ham and dauphinoise ficeles. My kids will be at their grandparents house for the afternoon, and I will be toasty by 3 pm. Let's get into the Holiday spirit as a team, guys. This potato casserole always reminds me of my girlfriends and the comical memory of them stuffing their faces around a glorious Christmas tree at Meghan's then new house. I hope this memory stays with me forever and reminds me of a time when everything felt right in my world. One of those excellent, and thankfully not rare, moments where it's all good. I'm in denial it's already December. Still trying to backtrack to the distant memory of Thanksgiving, and birthdays, and babies born, and date nights without early mornings to follow. Still trying to hold on to the past and all it brings to the present table. Still looking ahead at things to come and people to meet and grow with, new memories to make. All while staring at my wrinkling, dry hands typing at a vacant coffee shop, getting older with each sip of my cappuccino. I never announced this year what I'm thankful for around our hectic Thanksgiving table. As you might expect, second to family, I am insanely grateful for my girlfriends. For how they enrich my life, and more importantly, how each of us is making a difference in the world. Making and taking steps to help our daughters and sons (and ourselves) grow up in a time and place where they completely and totally have a voice. A world where we are teaching them to look up (from their phones), pay attention, and speak up. A world that will one day, hopefully, not be quite so scary. I do what I do for one reason. To gather around a table and share a meal with people I love and respect is truly all I need to feel fulfilled, joyful, and content. Let's take care of each other. And gather. Fill large bowl with cold water. Working with 1 Yukon Gold potato at a time, peel, then cut or mandolin slice into 1/8-inch-thick rounds and place in bowl with water. Repeat with sweet potatoes. Combine cream, butter, and garlic in medium saucepan; bring to simmer. Remove from heat. Mix all herbs in small bowl. Mix sea salt and black pepper in another small bowl. Butter a medium to large baking dish (glass is best). Drain potatoes, then pat dry with kitchen towels. Transfer half of potatoes to prepared baking dish. Use hands to distribute and spread evenly. Sprinkle with half of salt-pepper mixture, then half of herb mixture. Sprinkle with half of cheese. Repeat with remaining potatoes, salt-pepper mixture, herb mixture, and cheese. Pour cream mixture over gratin, pressing lightly to submerge potato mixture as much as possible. DO AHEAD: Can be made 6 hours ahead. Cover with plastic wrap and chill. Remove plastic wrap before baking. First of all, Happy New Year!!!! I probably should retire that salutation, but I'm still so happy it's a new year. I love the Holidays, don't get me wrong, but are you like me? Can you breathe a little easier knowing it's all over? Do we share a profound welcome to the quiet after the storm? Over-served, partied out, indulgent and exhausted? I'm nearly ready for a cleanse, definitely ready for this new year upon us, but granting myself continued joy the first two weeks of 2015. I think I'm going to bite the bullet and hit the third Monday of the year with Cafe Gratitude's ( I know, don't judge) three day cleanse. Just in time to buy a house, find a new school for our oldest, host a garage sale and Flynn's first birthday, pack and move to new house, transfer our entire life to the Valley, juggle two kids and feed everyone in the process. All good. It's life, right? By the way, amazing cleanse options in L.A. are Earth Bar,Pressed Juicery, and Cafe Gratitude. I have experienced and enjoyed Earth Bar's three day cleanse for the last two years, and while I love the delivery option, I believe both Pressed Juicery and Cafe Gratitude offer better juices, options, and pricing. So in preparation of a liquid diet, tonight I'm eating hearty. I'm eating French Onion Soup. The most important ingredient in my life. I am a middle child; A rule-breaker, outgoing, rebellious loyalist, attention-starved, and very very very talkative. I tend to go against the grain of what's popular. And currently in Los Angeles (and I'm sure, near globally) exercise, diet, and cleansing are like... super, super popular. The first Monday of this year, January 5th, I gawked at hundreds of Angelenos testing out their new Nike frees, running circles around town, working out as if they would die the 6th. All these eager-beavers trying to change... just because the date did! And now, I must admit, I just near-maxed-out a-credit-card buying new workout gear. What is it about a New Year that inspires such change? I must first eat this soup, workout, diet, cleanse, or not. Those onions eventually brown and turn into something I hope heaven smells like. 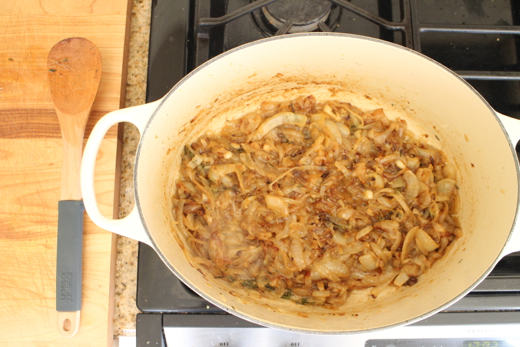 Browning onions will look way better in my new, brighter, brand new kitchen. I'm just now realizing this is probably one of my last posts from Wilshire Vista. Two of the many amazing things about Los Angeles are the pocket neighborhoods varying in size and demographic and a thriving sense of community. We have loved living near so many insanely gifted and giving friends in this area. Now, everyone please move to the Valley. When you see the onions go soft and get nice and brown, pay more attention to them. They need to be stirred frequently and any bits of brown should be scraped up for future flavor. If you've ever had a reason to buy oven-safe soup bowls, the time is now. You can ladle the soup into bowls, top with toasted bread followed by the cheese, then broil the whole thing for a few minutes to converge flavor and temperature. It will be so insanely hot that you'll have to sit and stare at your soup for at least five minutes. I've never been able to wait. I literally burn my tongue every. single. time. I've made this soup. However, if you don't have oven-safe bowls... make the soup, toast bread first for a few minutes, add cheese and brown, then add the whole slice (or 3) to the piping hot ladled soup. Both work perfectly. Next time, I'll toast the bread for a few minutes first and cut into little breadcrumb cubes, add to soup, top with cheese and broil all together. Cutting bread with a spoon can get agitating. Happiest, healthiest, most-productive and sensational 2015 to you all. Now pig out! In a heavy bottomed pot, melt the butter over low heat. Add sliced onions, thyme, salt and pepper. Cook, stirring occasionally until the onions become deep golden brown and very soft, 30-45 minutes. Add the flour and cook for 1 to 2 minutes. Add the white wine and scrape up any dry bits on the bottom of the pan, increasing the heat to a boil for 2 to 3 minutes. Add the beef stock, and the chicken stock, and allow the soup to simmer for an additional 30 minutes. Season with salt, and pepper, to taste. Preheat the oven to broil, or turn on the broiler. Arrange the baguette cubes on a baking sheet and toast until crispy, about 3 to 5 minutes. Remove the thyme sprigs and pour the soup into 4 to 6 oven-safe crocks or bowls. Top with the toasted baguette cubes and a generous amount of grated Gruyere. Place the crocks or bowls on a cookie sheet, under the broiler for 3 to 5 minutes, or until the cheese is melted and begins to brown.